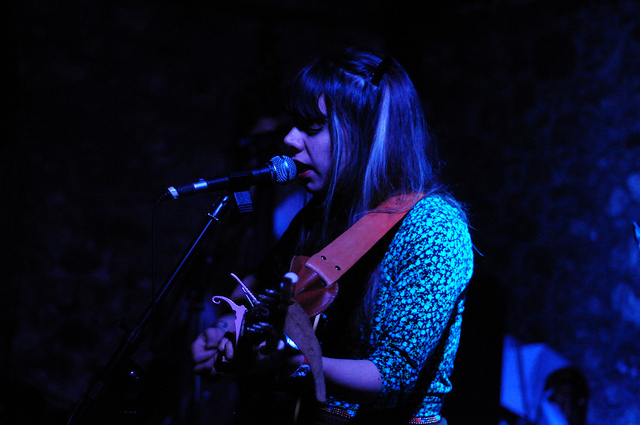 Hurray For The Riff Raff is one of those rare bands that seem to be even better every new time you see them. We were amazed at their growth when we saw them twice last summer. Those two shows are on constant play in my listening rotation and I expect to add last Thursday’s show at Knitting Factory to the mix. Fresh off what Alynda Lee called their “magical tour”, which included an appearance at the Newport Folk Festival and a leg of the tour opening for the Alabama Shakes in large venues, the Knit show was a band at its peak having fun and playing a varied setlist. We’ve spoken in previous posts about the brilliant 2012 release Look Out Mama, definitely a sleeper for those disconnected with today’s Americana music but a unanimous best-of for those who were paying attention. Hurray For The Riff are currently working on a new album which is expected in the Fall and the Knit show also saw the performance of what we believe were nine new songs that will eventually see release on that new record. Of those new songs, we’d heard a few at prior shows, including “Small Town Heroes”. But this particular version of Small Town Heroes was so intense and awe inspiring that we have to stream it below. Hurray For The Riff Raff will perform a free show in Lincoln Center at Hearst Plaza on Saturday August 10 at 1:30 pm. HFTRR will return for a full show in the Fall, venue and date to be announced by the band later today (along with full tour news). I recorded this set with the Sennheiser cards on a stand at the front corner of the soundboard and mixed with an excellent feed provided by the Knit’s FOH Rob. The sound quality is superb. Enjoy! Thanks for yet another excellent recording of this OUTSTANDING band !!! Agree 100% about ‘Look Out Mama’ being near the very top of all 2012 releases. For those feeling “disconnected with today’s Americana” look no further for relief than Greg Vandy’s program ‘Roadhouse Radio’ on KEXP out of Seattle on Wednesday nights (tonight) from 6-9 pdt. The best American / Roots program in the world trust me. You can tune in at the KEXP website by clicking the “listen live” 128 kbps link in the upper left corner of their home page, or listen in on the Tune-In Radio app on your smart phone at time of broadcast. Either way it is a killer show of the best Americana going today and yesterday !! Thanks again for all the great music you share and all your hard work to bring it to us … much appreciation indeed !! !